At first glance, the delightful pastel watercolour illustrations and the funny little story about a boy named Hugo, belie this book’s deeper and very important message. Which of course is why it’s such a fantastic book. 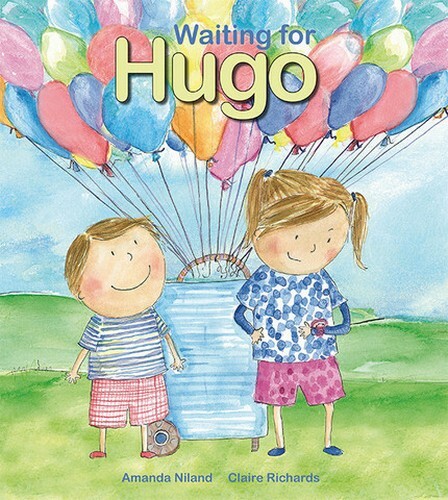 Waiting for Hugo by Amanda Niland and illustrated by Claire Richards is a story that explores notions of diversity and difference through a little boy who has an obsessive interest in numbers and counting. Hugo’s obsessive counting of everything from the number of trees in the park to schoolbags at the classroom door drives Hugo’s sister crazy. She’s painfully aware that Hugo’s fixation on counting is somewhat different to the things other four-year-olds are interested in and furthermore it means that she is constantly waiting for Hugo to finish his counting rituals. However, Hugo’s sister discovers that there is an upside to his unique abilities. Counting and a keen interest in numbers is a trait often present in children who have an Autism Spectrum Disorder. Waiting for Hugo deals with this little boy’s particular quirk in a gentle and sensitive way. Hugo’s parents are quietly accommodating of Hugo’s counting and the interactions between Hugo and his parents suggest patience and understanding. Richards’ illustrations bring warmth and humour to this story – Hugo’s sister is depicted with looks of both exasperation and pure joy, making this story realistic and easy to relate to. Find Waiting for Hugo online at Windy Hollow Books. The story is suitable for children aged three to seven years old.